Heavy duty mobility scooters are designed for larger individuals who may require extra seating space as well as more underlying support to carry their weight. 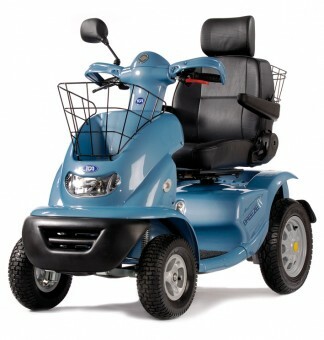 They are usually class 3 scooters capable of travelling on the road as well as being able to be used on off-road terrain. The strongest heavy duty mobility scooters can support a weight of up to 35 stone! A great example is the Shoprider Cordoba Mobility Scooter which features on our Shoprider review page. Heavy duty mobility scooters are generally powered with batteries in the 50-100 amp range. They will all have a full, well-built suspensions and at least 12-14″ wheels. Heavy duty scooters are rear-wheel-drive so they can easily support the added weight. Transporting them is usually more difficult and needs to be done using either a van or lift. Though they may be heavier with their sturdier frames, as a benefit they provide added power over more portable or lighter models. Most heavy duty mobility scooters will also come with anti-tip features as well as a vast variety of customisable options for added comfort and ease of use. Most companies such as Shoprider, Rascal, and Pride offer scooters that fall under the heavy-duty range. 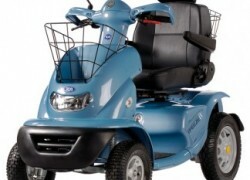 For individual reviews of these companies see the Mobility Scooter section of the website. Many heavy duty mobility scooters, since they are permitted to travel on the road, can also optionally be customised with a beacon so they can be driven on dual carriageways. With a top range of 35 miles and the addition of an all-weather canopy, your mobility scooter could function as a car! It would seem the possibilities are endless.